The “Chess Queen”, Alexandra Kosteniuk is one of the very few female chess players to have broken into the mainstream world and made a name for herself outside of chess. Before this though, she became a full Grandmaster, won the Women’s World Championship in 2008 and now is the 9th highest rated female. More recently, she has acted in a film, done fashion modeling and appeared in magazines. Kosteniuk’s name is sure to be a familiar one to people all over the world. Alexandra Kosteniuk learned to play chess from her dad at the age of 5. She achieved woman chess titles when she became a Woman International Master in 1997 and a Woman Grandmaster in 1998 at the age of 14. She then earned the men’s titles when she became an International Master in 2000 at the age of 16 and a Grandmaster in 2004 at the age of 20. 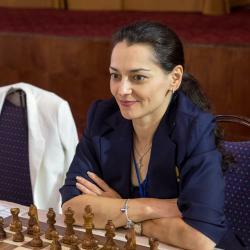 She was the tenth woman in history to receive the Grandmaster title. After earning the highest chess title, she won the 2004 European Women’s Championship tournament without losing one game and the 2005 Russian Women’s Championship with a 2691 performance rating. Her biggest accomplishment in chess is when she became the Women’s World Chess Champion in 2008 by defeating the prodigy from China, Hou Yifan. She didn’t hold on to the title for too long though because she lost to Ruan Lufei in the third round of the Women’s World Championship tournament in 2010. Since then, she has broken into the mainstream by acting in a Russian film, doing product promotions, modeling and being shown in magazines. She continues to have a high FIDE rating and is ranked as the 9th best female player in the world.